This blue and pink bubblegum cola bottle sweet is the most popular pick and mix sweet on the market, try it made into one of our delicious trees! Every tree is handmade by our chocolate elves and is an ideal gift for a sweetie lover. 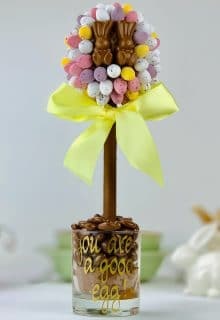 The glass vase is filled with the bubblegum cola bottles too, and the centre of the tree is also fully edible with a chocolate toffee crisp centre. So once you have picked off all the sweets, just keep munching! 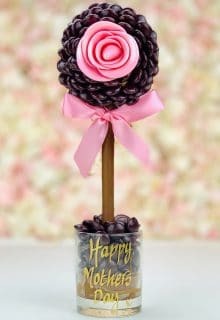 The two larger sizes are ideal for centrepieces for a party or baby shower, and a great sharing gift. Each is cellophane wrapped with a satin ribbon, protected with lots of bubble wrap and sent in a made to measure box to ensure your tree arrives safely. You can also make it personal with an option to hand script a message on the glass vase. Small Pink and Blue Bubblegum flavoured bottles with a fizzy sherbet sugar coating. Ingredients: Sugar, glucose syrup, water, pork gelatine, acids: E296, E330; raising agent: sodium hydrogen; flavouring, colours: E120, E133, E171. Chocolate ball contains Rice Krispies – rice, sugar, salt, malt flavoring, iron, ascorbic acid (vitamin C), alphatocopherol acetate (vitamin E), niacinamide, vitamin A palmitate, pyridoxine hydrochloride (vitamin B6), riboflavin (vitamin B2), thiamin hydrochloride (vitamin B1), folic acid, vitamin B12 (as cyanocobalamin), and vitamin D brown wheat flour (sugar, malt extract, vegetable oil, wholemeal, raising agents (sodium bicarbonate, tartaric acid and malic acid) and salt. Partially inverted refiners syrup.